Some would ask why forget? Well first of all, you can not truly experience the highs, joys and delights in life to the full unless you have also experienced lesser things that are dull, less exciting and perhaps even painful. Perhaps an example is called for here. My husband loves banana pudding, you know the homemade kind from scratch. So, about 2-3 times a year I will make him one and I believe He could eat the entire pudding if others were not around. Now, suppose I decided to make it weekly or even daily. After a time, no longer would it be an anticipated treat. Eventually, it would get old and at some point in time, I’m willing to bet it might actually become a chore to even think about spooning another bite into his mouth. There is much to be said for anticipation and only enjoying this delicious treat a few times a year builds anticipation and enhances the enjoyment. It prevents it from becoming commonplace and just another dull recipe that is over done and under appreciated. Secondly, we are human and let’s be honest; many of us tend to spend too much time rehearsing and focusing on the negative and painful rather than the positive and joyful. This can lead us to places that are not good for us or beneficial to us therefore in many cases it just doesn’t prove in our best interest to remember the past. Focusing too much on the past can also distort our vision of the present and future. It can quench our hope and give fuel to any doubts we may have. Hopefully you’ve never experienced going through such a rough patch in life that you have wondered if this is all there is or if it is even possible that life will ever be any different. Yet many times it is during times such as these that God displays His goodness, faithfulness, grace and love in our lives. Not because He is not needed all the time in our lives but because we tend not to see our need for Him in the good times. Unresolved issues with the past can also rob us of much future joy. It can cause us to not trust others and even not trust ourselves. It can keep us at arms length from those we may care the most about; it can cause us to build walls of protection that over time can become chambers of isolation that seek to imprison us. So today, on the cusp of a New Year I am resolved to not dwell on the past. I am resolved to remember His goodness, His faithfulness, His mercy and His grace. I am resolved to remember the times He has ran to my rescue in times of trouble or pain and remember the delights I have experienced in my relationship with Him. I am resolved to Let it Go where lesser things are concerned and focus once again on 2015 and the years to come with expectation. I am resolved to be alert to His movement in my life; to choose life and blessing;to choose love and forgiveness; to choose mercy and grace! Will I succeed or fail? Yes, for I am human. The past will try to sneak up on us and sneak in to remind us of it’s presence but there is a greater Presence and in Him we can be more than overcomers! Have a Happy and Blessed 2015! May it be filled with grace and peace!! My next thought, or maybe it was His still small voice…”you’re not God, only He holds all things together.” Then I remembered another friend speaking recently on putting all our expectations in God and a Sermon about not drowning in the shallow water. Knowing myself well enough to know if I did not stop, there would be no sleep tonight: I made some notes and resolved that I can not fix anything, nor can I hold it together. I am going to pray and go to sleep, this will still be here tomorrow! And it was! We can not choose for another, only for ourselves! We have been through a lot tougher things in our lives, compared this is shallow water! Shallow water… You can actually stand up now and walk! Stand up, breathe deep and walk out of the water!!! I can not change anyone or anyone’s mind, not even my own without Him! Walk in both gratefulness and in the rhythm of His grace in my life! Yes, even when it is tough! Walk in expectation! 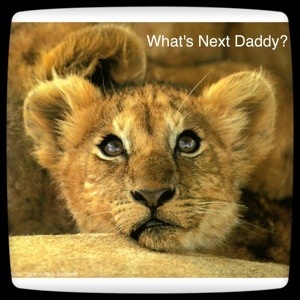 What is next, Daddy?